Price is for either 10, 6, 4, or a single Chinese silver charm, depending on which one. Please select from the above drop-down-list and add each design individually to your shopping cart. Carrying charms to ward off evil dates to Neolithic times where hunters wore stones for luck. Egyptians used charms for identification and to please their gods in the afterlife. In Roman times, Christians hid fish charms in their clothing to identify themselves to other believers - the Greek word for fish was an acronym for Christ. Charms protected medieval knights, and in the Dark Ages they represented heritage and religion. Latter, superstition made charms an important part of life for most people - even the common folk depended on them for well being. Today’s charm jewellery stems from Queen Victoria’s fascination with charms and pendants, making elaborate charm bracelets fashionable amongst the gentry of the time. Why wear a charm bracelet? Charms are often collected as reminders of good times, and are carried because their sentiment makes the wearer feel comfortable. Modern bracelets allow charms to be added and removed to express moods, explaining their continued popularity. One is never too old for a charm bracelet. Celebrities like Elizabeth Taylor and Joan Crawford decorate their wrists with them, and top hip-hop singers wear million-dollar Shamballa bracelets. All make you feel good and are great conversation starters. 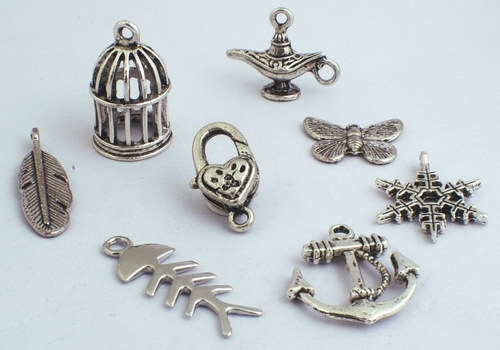 When choosing charms, apply your style and sentimental history. Go with a theme that tells a story - such as expression of love, favourite animals or colours. Fine-boned wrists need tiny charms, unless you have big hands. Larger charms on a chunky bracelet are best for larger bones. Long and thin arms are lucky enough to be able to stack a multitude of charm bracelets, Cleopatra style. Charms on a bracelet should face outwards, although some prefer the other way.